- There was a lively, noisy crowd of supporters outside the court at 9am, and many stayed to watch the trial itself. The public gallery has 26 seats, but by 11am it was crammed with around 40 people. 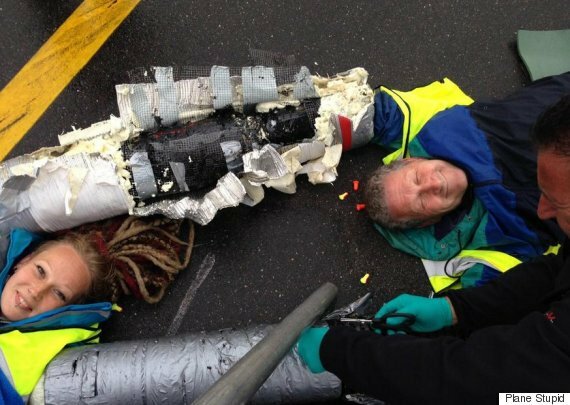 - The defendants are facing two separate charges for their protest on the Heathrow runway in July: trespass in a restricted zone and aggravated trespass. - Their defence against both charges relies on the idea of necessity – they are arguing that their actions were justified because by blocking the runway they were preventing a greater crime, in the form of climate change and local air pollution from Heathrow. - There is no automatic right to run a justification defence for these particular offences, it is up to the judge to decide whether it is appropriate. So one of the first concerns for the defendants was whether the judge would even allow them to run their chosen defence, or throw it out at the start. - Fortunately, the judge has not (yet) thrown out their defence. In fact, she started the trial by clarifying an important fact relating to this defence: to be found not guilty, the defendants would not have to prove that aviation emissions cause climate change – they would need to prove that *they believed* that the impact of Heathrow’s emissions was so large that they were compelled to take action to stop them. - The judge used this point to argue that she may not need to hear live evidence from the defence’s climate sciece expert – instead, she wondered, could the prosecution and defence not simply come to an agreement that aviation makes a significant contribution to climate change? - As a supporter of the defendants, I have mixed feelings about this. While it’s helpful that the judge recognises that climate change is real and serious, it is much more powerful to have a live witness on the stand giving expert testimony. I hope the judge changes her mind about this. - The judge also mentioned the local residents who are due to give defence evidence about the health impact of Heathrow’s pollution. She stated that she did not consider that their statements counted as “expert” testimony because they did not themselves have professional medical training. I’m not sure if that has any legal significance or was just a semantic point, I guess we’ll hear more about it if/when those witnesses give evidence. I left at 11.30am, by which time the prosecution had begun to make their case. They’re expecting to complete their side of the case in the first day or two, because no-one is disputing the basic facts of the case – that the thirteen defendants went onto the runway and disrupted airport operations for six hours. Everything hinges on whether the judge can be convinced that the defendants’ actions were necessary and proportionate to the threat the airport poses to people’s health, lives and property around the world. It’s very hard to tell her position at this stage, but at least she seems willing to acknowledge the possibility of a defence along these lines. Which is a good first step. Much love and solidarity to all the defendants. Airport expansion is simply not compatible with a liveable climate, and whatever the outcome of this trial the #Heathrow13 have already done us all a huge service by stopping a swathe of aviation emissions and throwing a spotlight on this urgent issue. We shouldn't ever put too much weight on the findings of a single poll. However, there's some very interesting stuff in here about why people voted the way they did on May 7th. 54% of voters want an end to the Government's austerity measures - including more than half of UKIP voters and even 1 in 6 Tory voters(!). 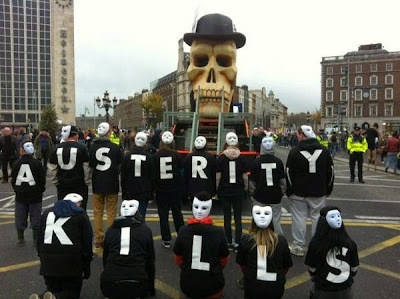 This matches with other recent polls that have shown support for austerity steadily falling since 2010. So how have we ended up with a Government that will now try to push through even harsher cuts and privatisation? The first-past-the-post voting system is the reason why the Tories have a majority on just 37% of the vote, but the deeper problem seems to be that many simply trusted the Conservatives more on the economy. When asked their top three reasons for voting Tory on Thursday, only 49% of Conservative voters said that the party's promises (i.e. their policies) were a significant reason. In other words, half of Tory voters thought that other factors were more important than policies - they just trusted the party more in general, or preferred Cameron over Miliband as Prime Minister. I find this both depressing and encouraging, in different ways. The depressing bit is that the Tories have managed - with the help of the corporate media - to set the terms of the debate, present themselves as generally more trustworthy than the other parties, and persuade a lot of people that - whatever you might think of their specific policies - they're just "safer" to vote for when it comes to the economy, jobs and so on (despite the fact that in reality they're actively destroying these things). Many seem to believe they were helping improve conditions for the vulnerable and defending the NHS by voting Conservative, because however bad things were now, a Labour (or Labour/SNP) government would be worse. This is unbelievably frustrating, but does mean that not all Tory voters are necessarily cruel and heartless; many are just misinformed. Not that a Labour government would have been *that* much better, but still. The encouraging bit is that Thursday's vote didn't represent the ringing endorsement of austerity that the Tories will now pretend that it did. This is important, because it means that when we take to the streets, the picket lines and the occupations to fight back against against the horrific cuts and privatisations that the Tories are about to throw at us, we know we have the support of the majority behind us. More than half of voters - including 83% of Labour voters, 54% of UKIP voters and even a sixth of Tory voters - want austerity to stop. If we include all the non-voters in the equation, the majority against austerity is probably much higher. The scariest poll result is that 41% of voters put "controlling immigration" as one of their top three priorities for the country, and 29% even believe it is one of the top three issues affecting themselves and their family. To change this, we'll need to get out of the echo chamber of social media and into our communities, finding ways to support people who are struggling and to challenge the creeping racism and xenophobia being whipped up by politicians and the media. If we want a different sort of government (rather than a choice between Tory and Tory-lite), we need to start building the kind of society that we want to see. Start by changing people's hearts and minds, challenging the media lies, building new hopeful narratives and supporting each other, and the politics will follow. I've been getting annoyed by the whole "it's not racist to go on and on about immigration" thing, so I looked at some numbers. The supposedly "non-racist" arguments around immigration seem to focus on the "extra pressure" that immigration creates on welfare, public services, jobs etc. Putting aside the fact that this is massively over-simplistic (it ignores how the economy actually works, whose fault it is that there's so much unemployment and underemployment, all the tax that immigrants are paying etc. ), it boils down to this: a concern about rising population. So when people make these (ahem) "non-racist" arguments around immigration, they're essentially saying they're worried about the UK's rising population. But if that's the case, then why focus solely on immigration? Last year, the UK population grew by around 400,000 people (in a population of 64,100,000), according to the Office for National Statistics. More than half of this growth was due to births with only 46% from net immigration. This means that all those people who claim to be worried about the impact of immigration on schools and hospitals and the welfare budget need to ask themselves: why is the extra impact of someone born overseas who moves here a "problem", but the extra impact of someone born in the UK is no problem at all? I don't hear any UKIP politicians calling for a slowing of the birth rate to "ease pressure on services", even though UK births account for more than half of the "problem", especially when you take into account the fact that all the people being born are children, who are just a bloody drain on the country compared to immigrants (who are mostly adults and want to work, contribute to the economy, pay taxes etc.). So...you're not being racist but... you're saying there's some sort of difference between the UK population being added to by someone from abroad (which is an outrage) compared with someone born in the UK (which is totally fine). It isn't racist to want to talk about immigration. However, to use anti-immigration arguments based on the idea that people from elsewhere create some kind of "problem" that UK-born people don't...that's a different matter. Some people might point out that strictly speaking, these could be seen as "only" xenophobic rather than racist arguments, to which I would reply: get a grip. If you're using these arguments then you're basing your point on irrational prejudice against others, and contributing to a climate of suspicion and fear against people born in other countries. The label we give it is less important than the effect it has, which is a deeply divisive and negative one. Whether or not these kinds of arguments are "racist" according to some strictly semantic definition ignores the fact that airing them helps to bolster and promote a deeper thread of racism that runs through our society. Yes, I know that facts and figures alone won't do much to change people's minds on this (we also need different, more compelling narratives about who the real enemy is and why they want to distract and turn us against each other with immigrant-bashing rhetoric). I just wish that journalists would ask UKIP politicians these kinds of questions. PS Of course, if I actually confronted a UKIP politician with these arguments I suspect they'd change tack and start going on about Eastern Europeans being willing to work for lower wages and take people's jobs, but that's a whole different argument to the "pressure on services" thing that's been annoying me today, and is a route into a whole other discussion about whose fault it REALLY is that there's a lack of decent employment, falling real wages etc. and how there are more meaningful, compassionate and effective things we could do about it than some doomed and hateful quest to restrict immigration. For which I am very grateful. I'm particularly grateful to all the amazing volunteers and performers on the Free Fringe, without whom I would not have been able to perform at all (to put on a show in one of the paid Fringe venues, you have to stump up thousands of pounds in advance; the Free Fringe, by contrast uses free venues and asks performers for just a small donation to cover costs). Huge thanks also to everyone who came to see the show, wrote about it, talked about it, and persuaded others to come along. Without you I would be, well, bellowing rhyming couplets at an empty room. More than usual. So what next? Well, a Very Exciting Thing: I'm going to be performing the show as a double-bill with the wonderful whirlwind of lyrical energy that is Pete The Temp. He's touring his excellent show "Pete The Temp vs. 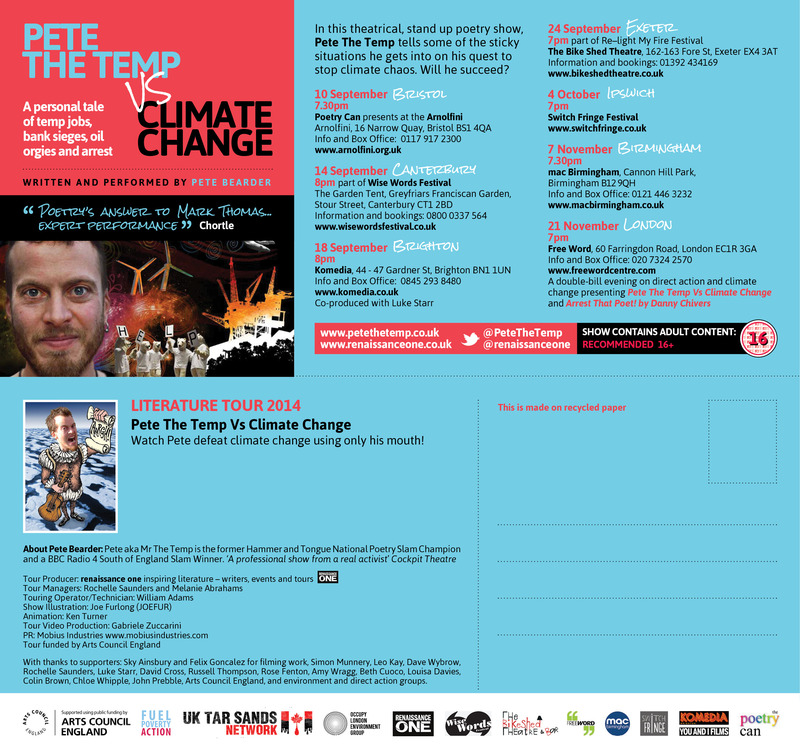 Climate Change", and we'll be performing both our shows back-to-back (not literally) at the Free Word Centre in London on Friday November 21st. If that sounds like the sort of thing you'd like then you can book tickets here. 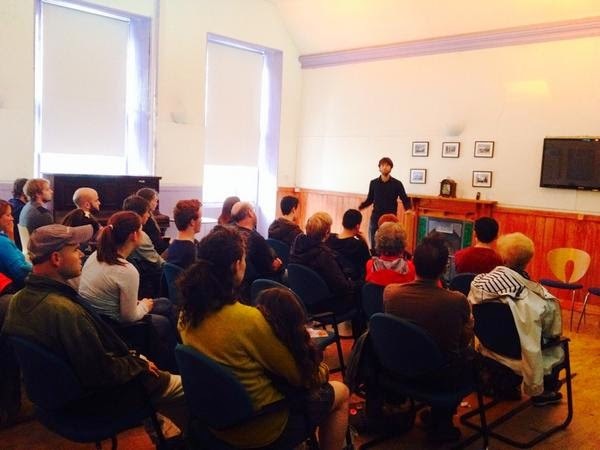 My first mini-review at the Fringe! Ooh look - WOW247 have got me as one of their "5 spoken word shows to catch at the Fringe". "Danny Chivers may appear to be a foppish young man from Bristol – partly because he is. But as well as this, he is also a politically active slam poet who has been chained to a construction company’s staircase and sued for five million pounds. Danny talks about his scrapes with the ‘powers that be’ (and Richard Madeley) over the issues of climate change and environmental causes in a show that’s both funny and thought-provoking." Particularly excited to be described as "foppish" for the first time in my life. Makes me want to rush out and buy a silk handkerchief and top hat forthwith. I've been shortlisted for an award! Ooooh - I've just learned that my show, "Arrest That Poet! 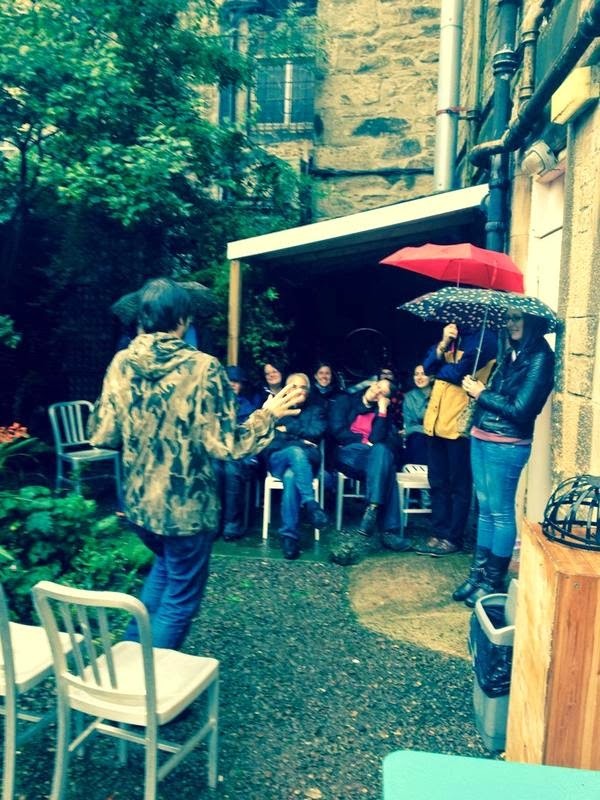 ", has been shortlisted for the Edinburgh Fringe Sustainable Practice Award. This award, supported by the Centre for Sustainable Practice in the Arts and Creative Carbon Scotland, aims to highlight and celebrate artists who are engaging with the topic of climate change in creative and innovative ways. Have you ever climbed up a power station, D-locked yourself to a construction company’s staircase or been sued for £5 million? Until recently, slam poet Danny Chivers certainly hadn’t. So how did a quiet boy from Bristol end up being spied on by undercover cops, battling criminal charges and trying not to thump Richard Madeley, all in the name of a safer planet? Obviously, the only sensible way to stand up to oppressive police tactics is to turn them into an Edinburgh Fringe show. So now storytelling meets poetry in this darkly funny true tale of rhyming and rebellion, featuring insider stories from anti-fracking protests, outrageous mass arrests and a close encounter with notorious police spy Mark Kennedy. “Feisty, thought-provoking and politically rounded ... a seriously funny rising star” (New Internationalist Magazine). Danny Chivers has been performing stand-up poetry since 2006. He’s an Oxford Hammer & Tongue Slam Champion, and was a semi-finalist in the BBC Radio 4 National Poetry Slam. In his first full-length stage show, Danny weaves together lively, humorous poetry with real-life tales of the strange events surrounding his four arrests at environmental and social justice protests. 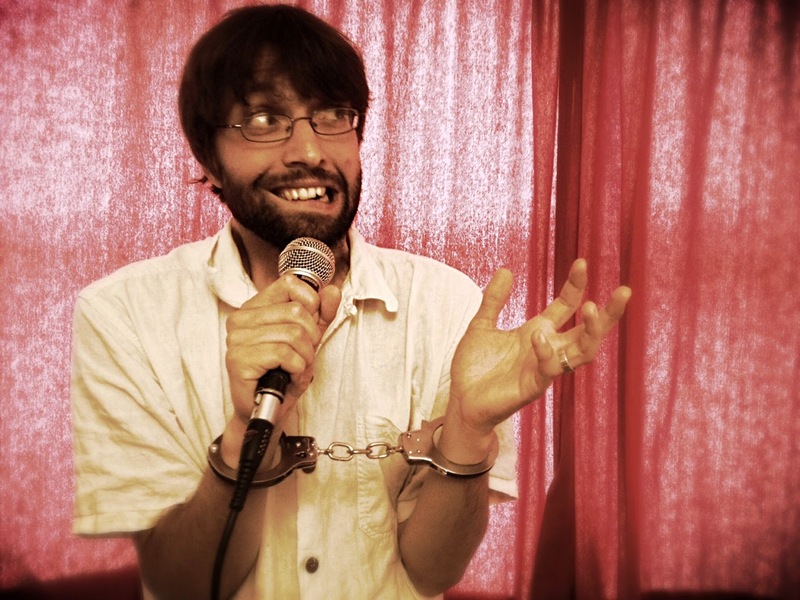 Danny’s show, “Arrest That Poet!” is part of the PBH FreeFringe. "Danny Chivers is a slam poet and environmental activist. His attempts to battle injustice using dodgy rhymes and D-locks have seen him arrested four times, spied on by undercover cops and sued for £5 million. His new show blends storytelling, poetry and politics into a darkly funny true tale of rhyming and rebellion." I'm going to be part of the Free Fringe in Edinburgh, which is brilliant - there's no door fee, you just put some money in the bucket as you leave, based on how much you can afford and what you thought of the show. As you can see in the list to the right of the screen, I've also got warm-up performances of the show lined up in Cambridge, Manchester, Norwich and Newport (Shropshire), and should be adding London and Oxford to that list soon. 01/05/2014: Performance on the Oxford Playhouse's soapbox, out on the streets as part of the May Morn celebrations, Oxford! 27/06 - 30/06/2013: Performance as part of the "Rabble Rousers" poetry troupe with Lucy Ayrton and Merrick, Various times, Speakers Forum, Greenfields, Glastonbury Festival. 15/11/2012 - Late poetry gig at the Albion Bookshop, Walton Street, Oxford, 9.30pm. 13/11/2012 - Poetry performance in St Andrews, hosted by the People & Planet society, 8pm. 12/10/2012, 8pm - Slam The Cuts at the Cuts Cafe, London. With Claire Fauset, Pete the Temp and Street Lighting Man. 14/01/2012 - 3pm performance on the steps on St Paul's as part of Occupy London's Arctic ice event. 14/09/11 - 20/12/11: I was out of the country for some flightless travel around the Med by boat, bus, train and camel. 13/06/2011 - 2pm - 5pm talk, workshop and performance at Birmingham University, Arts Building. 25/04/2011 - 7.30pm, Performance for Headstand, at The Emperor, Hills Road, Cambridge. 18/12/09 - With Thea Gilmore at the Oxford Academy, Cowley Road. 05/12/09 - Camp for Climate Action, Trafalgar Square! I am currently running talks and workshops based on my recent book "No-Nonsense Renewable Energy", calculating carbon footprints for development charities, running eco-poetry workshops in schools, planning new performances of my stage show, and co-managing the 'Cyc du Soleil' cycle-and-solar powered sound system for bringing low-carbon performance and education to festivals, schools and other events.